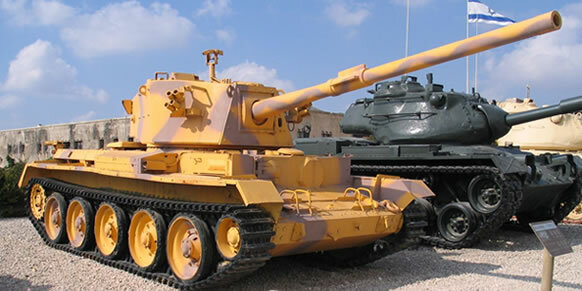 The British Charioteer Tank Destroyer entered service with the British Army in 1954. It wasn’t a new vehicle with a long development process, but rather an amalgamation of existing components. It used the hull of the WW2 Cromwell tank and the 20pounder main gun of the Centurion medium tank, in a new unsophisticated turret. The 20pnder fired armour-piercing capped ballistic cap (APCBC) and sabot rounds. It could defeat 287mm of RHA steel at ranges of 1000m, which was than enough to take out a Russian T-55 which were being built at an alarming rate. 200 were built by Robinson and Kershaw Ltd and sent to West Germany. 56 were purchased by Austria in 1956 and Finland 38. Jordan also purchased 24 vehicles in 1954. Lebanon received 2nd hand vehicles and used them in the 1978 South Lebanon conflict.